Setapp is a subscription service that makes a collection of hand-picked curated apps available for a monthly fee of $9.99 / month. The app is designed to be an alternative to the official App Store Apple use. Unlike the App Store, they hand-pick the best apps from each category for Setapp and, thus, offer the best solutions available to you. Also, it’s cheaper to pay $9.99/month and get unlimited access to all apps than to spend $30-40 for each application. You get unlimited access to the apps and that includes updates and eventual in-app offerings as well. To use this service you download Setapp and install it on your Mac. This creates a special folder on your Mac where all apps are available for you as long the subscription is active. You can use the apps offline so the only need for Internet connection is when you first install an app or want to update it. 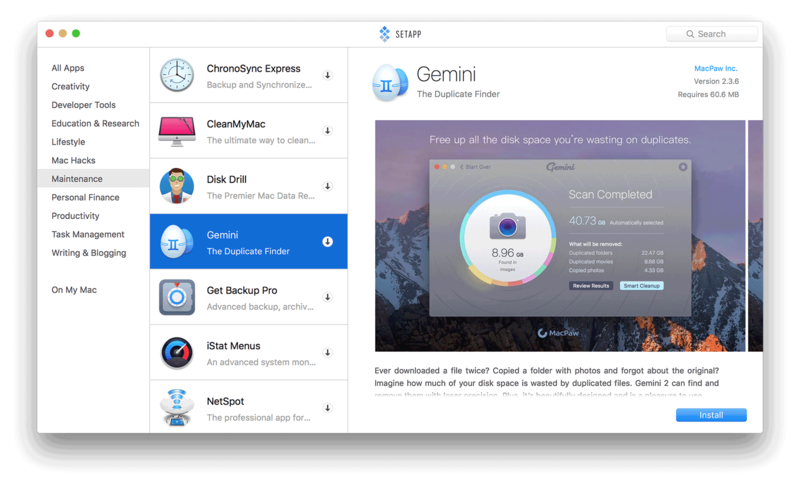 MacPaw who is the brains behind this (Clean My Mac, Gemini) adds more apps all the time. Some of the available apps I already have and used before. Like iFlicks, iStat Menus, MacPaw Apps, WiFi Explorer to name a few. There are some great selections here. Check out apps you can get here: Best Apps for Mac, Yours to Explore. They have a 30-day free trial. No credit card required and you can cancel anytime you want.